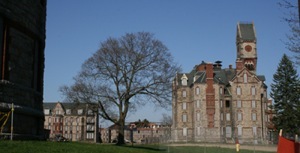 Saint Elizabeths is a Kirkbride style institution established in 1855 in Washington D.C. While the The East Campus still operates as a mental health facility, the West Campus now operates under the GSA. I was fortunate enough to be granted access to the West Campus before this conversion started. The photos below are of the West Campus only.